Sir John Vanbrugh designed the house for his brother Charles, who bought it outright at cost price. As executed the elevation differed in several respects from this drawing. It was newly finished in 1722 when the antiquary, William Stukely, sketched it and it stood on the north east corner of the field. The house was demolished in 1902. 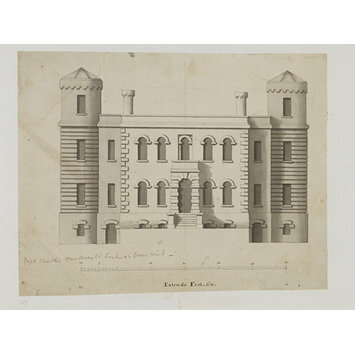 Design for the south elevation of the house known as `Mince-Pie' House or Vanbrugh House at Greenwich, showing nine bays including the two corner towers with banded rustication. Scale: 1 inch to 10 feet. Vanbrugh designed the house for his brother Charles, who bought it outright at cost price. As executed the elevation differed in several respects from this drawing. See Whistler, fig. 88. It was newly finished in 1722 when the antiquary, William Stukely, sketched it and it stood on the north east corner of the field. The house was demolished in 1902. See Downes, 1987, p 434. 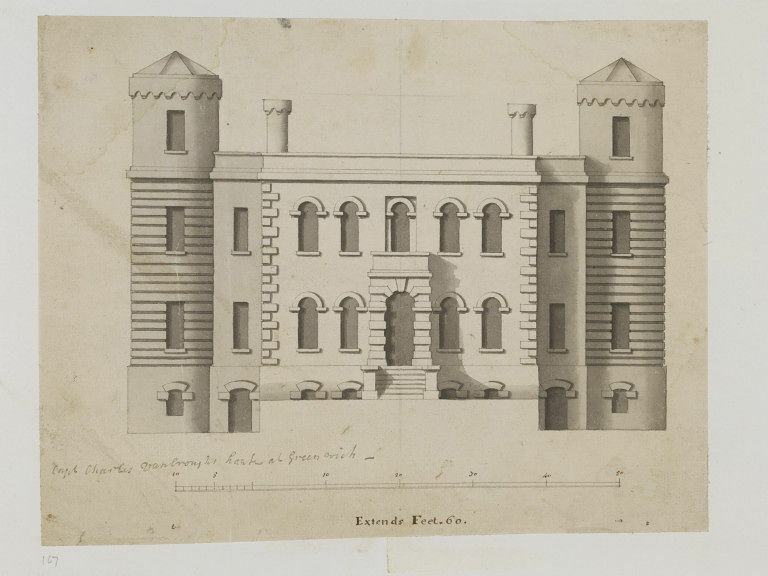 Design for the south elevation, Vanbrugh House, Greenwich; the Vanbrugh Album; office of Sir John Vanbrugh; ca. 1720-1722. Lorimer, C. and Newton, C. (ed. ), The collection of drawings by Sir John Vanbrugh and his circle in the Victoria and Albert Museum, London: V & A, 1996, p. 46, cat. 115. Whistler, L., The Imagination of Vanbrugh and his Fellow Artists, 1954, fig. 88.